These are not adjectives often used to describe Pearl Jam, the 30 million-selling purveyor of angst-ridden guitar rock now approaching its 19th year of existence. And yet these are the words being used on blogs to describe “The Fixer,” the first song from the Seattle rock band’s ninth album, “Backspacer.” A surging, ’80s-style rocker written by drummer Matt Cameron, “The Fixer” debuts this week at No. 2 on Billboard’s Rock Songs chart, an audience-based tally of all rock stations. You can’t blame Cameron, singer Eddie Vedder, bassist Jeff Ament or guitarists Stone Gossard and Mike McCready for smiling wider than usual. President George W. Bush, who the band vilified in song and onstage for eight years, is gone. The group remains a huge touring draw and A-list festival headliner, having grossed nearly $42 million from 51 shows reported to Billboard Boxscore from 2006 to 2008. Vedder won a Golden Globe for his soundtrack to the 2007 movie “Into the Wild.” Life is quieter on the homefront, too: Four out of the five band members now have children. But Pearl Jam is also celebrating because it finally made good on a longstanding desire to release its music on its own, without the aid of a major label. “Backspacer” will come out Sept. 20 in the United States through a creative patchwork of deals with physical and digital retailers, the most prominent of which is a one-off, big-box exclusive with Target. Internationally, Universal Music is the label for the release. The Target partnership threw fans for a loop when the news leaked in June. At first glance the move seems at odds with a band whose DIY, fan-first business ethic has set it against corporate behemoths like Ticketmaster and AT&T. But as details began to emerge, it became clear that Pearl Jam managed to make a deal that rewards the band and its fans as much as it does the stores that sell its music. Target agreed to let independent music retailers carry “Backspacer,” a first for one of its exclusives. (The album will be distributed to indie stores by the Coalition of Independent Music Stores’ Junketboy division.) “Backspacer” will also be sold on Pearl Jam’s Web site and at Apple’s iTunes Music Store. When Pearl Jam ended its career-long association with Epic in 2003, the band wasn’t yet ready to proceed without label backing. So manager Kelly Curtis cut a one-off, joint-venture deal with J Records for the 2006 release of a self-titled Pearl Jam album, which spawned three rock radio hits and has sold 706,000 copies in the United States, according to Nielsen SoundScan. That figure far exceeded the sales of the band’s 2002 Epic farewell, “Riot Act,” which sold 508,000. Curtis says he was thrilled with J’s work on the album in the United States, but internationally, “it was a nightmare. Sony had just merged with BMG, and we couldn’t get anything done.” With that in mind, he was confident Pearl Jam could devise a way to distribute its next album by itself in the States, but he knew the band would still need help with the rest of the world. To test the waters, Pearl Jam cut the first mobile deal of its existence with Verizon in 2008, which brought the band’s legendary live bootlegs to the company’s V Cast service. The partnership was put together by Michele Anthony, the former Sony Music Label Group U.S. president/COO who was by Pearl Jam’s side for its biggest successes in the ’90s. “Our goal was to be able to give the fans access to the music the way they want to access it,” says Anthony, who was inspired to kick-start a mobile presence for Pearl Jam after she and Curtis saw how ubiquitous music consumption was on cell phones in China. 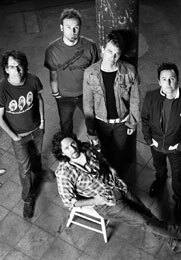 The mobile bootleg campaign was so successful that Pearl Jam teamed with Verizon again to deliver content from the deluxe reissue of the band’s debut album, “Ten.” The partnership has been re-extended to include ringtones and ringbacks for songs from “Backspacer,” which will roll out at a rate of one per week until release date, as well as mobile bootlegs for the band’s fall tour. Curtis also balked at the waste involved in having to create different versions of “Backspacer” for various partners, a common requirement of retail exclusives. Instead, the album is encoded with Sony DADC’s eBridge technology, which allows purchasers to unlock extra content when they put the disc in their computers. The Target discs will link to a virtual “vault” of 11 concerts spanning Pearl Jam’s career, from which fans can choose two. The band will also create an organic cotton T-shirt to be sold at Target, with proceeds earmarked for the hunger relief charity Feeding America. And in September, a Cameron Crowe-directed TV ad will air featuring footage shot during a private performance at Seattle’s Showbox in late May. That’s not the only thing Vedder is thinking about, either. While acts like AC/DC and Aerosmith were winning new fans with branded versions of “Rock Band” and “Guitar Hero,” respectively, Pearl Jam was sitting on the videogame sidelines. The band finally took the plunge this spring when it made all of the songs from “Ten” available for download on “Rock Band” the same day the reissue hit stores. Curtis declined to discuss sales, but sources at MTV say the “Ten” songs have generated more than 850,000 downloads. “Backspacer” will also be available on “Rock Band” the day it comes out, and Target has an exclusive on an edition of the album featuring access to download its songs for “Rock Band” on Xbox Live and PlayStation Network. It’s a precursor to a dedicated Pearl Jam game that could hit stores in 2010. Although MTV wouldn’t confirm details, fan input is already being solicited on PearlJam.com to determine which live versions of songs from the band’s catalog will be included. For radio promotion, Curtis hired a team of indies to promote “The Fixer” at various formats, including former Epic promotion vet Laura Curtin, who worked “Ten” nearly 20 years ago. Alternative, active rock and triple A stations took the lead on playing the single during the week ending July 26, with Los Angeles’ KROQ leading the way with 58 plays, WAAF in Boston with 45 plays, and Seattle KISW and KNDD with 44 and 43 plays each, according to Nielsen BDS. Industry observers are obviously curious to see how Pearl Jam’s plan plays out. If successful, it could inspire a host of established bands to try a similar approach, according to Tsunami Entertainment president Bruce Kirkland, who has helped negotiate numerous exclusives between artists and big boxes, including the Pearl Jam/Target pairing. Vedder titled the album as an homage to an oddly named typewriter key that fell out of fashion 50 years ago. The frontman, who still uses typewriters for lyric writing and personal correspondence, says he got upset when he saw vintage typewriter keys being used as jewelry. “For me it was like shark fin soup: ‘You’re killing typewriters for a bracelet!’ ” he says. Pearl Jam will play its first live show in more than a year Aug. 8 at the Virgin Festival in Calgary, Alberta. After a quick four-show run in Europe, the band will then visit Toronto (Aug. 21) and Chicago (Aug. 23-24) before headlining the Outside Lands festival Aug. 28 in San Francisco. Multiple shows in Seattle, Los Angeles and Philadelphia follow in September and October, with the Philly gigs set to be the final ones at the Spectrum. Also on tap is a headlining slot Oct. 4 at the Austin City Limits festival, plus a run of shows in Australia, New Zealand and Hawaii in November and December. Curtis says the plan for 2010 touring is still coming together and that the band is deciding whether to play outdoor amphitheaters or arenas, which it prefers.